ECOCAPSULE is a high-tech self-sustainable transportable home, equipped with solar cells and a wind turbine. It is also able to harvest rainwater, as well as filter water from natural sources, thus making it energetically autonomous. 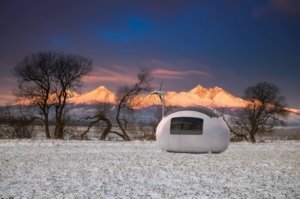 ECOCAPSULE promises to provide a whole new level of freedom. It is suitable for many different types of use e.g. as a house, caravan, houseboat, hotel, an independent research station. Overall, the pod provides 8.2 m2 of living space featuring a kitchenette, a shower, a waterless separating toilet, working space, storage, and a folding bed for two people. ECOCAPSULE cannot move on its own, however, the producers have developed a custom trailer which can easily carry the unit, so the pod can be towed behind a vehicle. In addition, thanks to its compact size, the mobile home can be airlifted or loaded into a shipping container, making global transportation more seamless than ever. The first generation of ECOCAPSULES has been available for pre-order since 2016 and is available now in the first, exclusive, customizable series, limited to 50 pieces. The production of a second, mass-produced series, which will have a lower price tag is planned for the end of 2018. At this point, ECOCAPSULE has hundreds of pre-orders from customers from all over the world, and we know already that one of the micro-homes will belong to a Hollywood actresses. Last year, ECOCAPSULE has successfully completed the first investment round on the equity-based crowd investing platform Crowdberry, raising 750.000 EUR and gaining 11 new international investors. The money was used to complete design, product development and testing, to build the infrastructure, the team, and the supply and sales network necessary for the launch of serial production. The company has recently entered the second investment round on Crowdberry with an ambitious new funding goal of 2 000 000 EUR. The plan is to use the funding to finalise the assembly process, drive production, meet demand, create a global distribution network, as well as to strengthen marketing activities. Why crowdfunding in the first place? We have chosen crowd-investing because it’s a much easier solution than to work with one big investor. What has helped was also the fact, that Crowdberry has been watching over the whole process. Did you have previous experience? What do you think attracted your investors besides the obviously brilliant idea? This is more a question for our investors, but based on their reactions, it was mostly the uniqueness and global potential of our product.